Here I am sitting in a cab in New York City. I’m headed uptown to Columbia University where we’re holding the first-ever American Disruption Summit. You can register to watch for free here… more on that in a minute. The driver and I are talking about the absurd price tag of the latest Apple (AAPL) iPhone. He’s shocked when I tell him the cheapest model is $1,149. “Who can afford that?” he asks. In today’s letter I’m going to show you why Apple stock is a terrible investment. Apple has had an incredible decade. Since the iPhone debuted in 2007 its sales have jumped 10X. Its stock has appreciated over 700%. And up until November it was the world’s largest publicly traded company. But two weeks ago, Apple management issued a rare warning that shocked investors. For the first time since 2002 it slashed its earnings forecast. The stock cratered 10% for its worst day in six years. 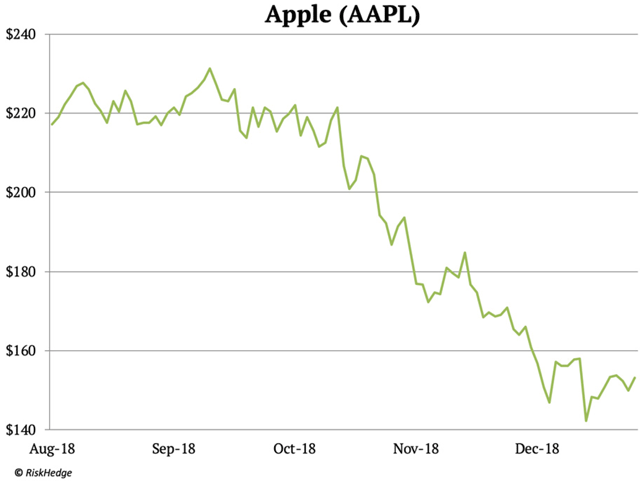 This capped off a horrible few months that saw Apple stock crash roughly 35% since its November peak. The plunge erased $446 billion in shareholder value… the biggest wipeout of wealth in a single stock ever. From looking at its sales numbers, you wouldn’t know anything is wrong. 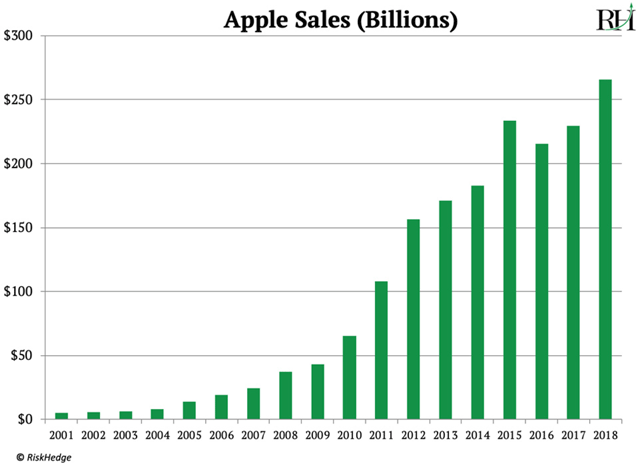 Apple’s revenue has marched up since 2001, as you can see here. By the looks of the chart, Apple’s business is perfectly healthy. But there’s a secret hidden behind these headline numbers. Although Apple’s revenue has grown… it is selling less iPhones every year. In fact, iPhone unit sales peaked way back in 2015. Last year Apple sold 14 million fewer phones than it did three years ago. In 2010 you could buy a brand new iPhone 4 for 199 bucks. In 2014 the newly released iPhone 6 cost 299 bucks. As I mentioned, the cheapest model of the latest iPhone X costs $1,149! That’s more expensive than many laptop computers. It’s a 500% hike from what Apple charged eight years ago. Not all that long ago, a flat-screen high-definition TV was a luxury. Even a small one cost thousands of dollars. Today you can get a 55-inch one from Best Buy for $500. In 1984, Motorola sold the first cell phone for $4,000. According to research firm IDC, the average price for a smartphone today is $320. But Apple has hiked its smartphone prices by 500%! Frankly, it’s remarkable that Apple has managed to pull this off. But let me tell you… Apple is a disruptor in decline. It comes down to the lifecycle of disruptive businesses. Twelve years ago only 120 million people owned a cell phone. Today over 5 billion people own a smartphone, according to IDC. Apple was the driving force behind this explosion. As the dominant player in a rapidly growing market, it grew into the most profitable publicly traded company in history. As I mentioned, iPhone sales growth stalled out in 2015. This would’ve been the end of the line for most businesses. But Apple did a masterful job of extending its prime through price hikes. Its prestigious brand and army of die-hard fans allowed it to charge prices that seemed crazy just a few years ago. But now iPhone price hikes have gone about as far as they can go. After all… what’s the most you would pay for a smartphone? You might wonder… how bad, exactly, is the decline in iPhone sales? It’s so bad that Apple now keeps it a secret. In November, Apple announced it would stop disclosing iPhone unit sales. Keep in mind, the iPhone is Apple’s crown jewel. It generates two-thirds of Apple’s overall sales. A publicly traded company that makes most of its money from selling phones is no longer telling investors how many phones it sells! And its other business lines can’t pick up the slack for falling iPhone sales. Twenty percent of Apple’s revenue comes from iPads and computers. Those segments are also stagnant. Which means 86% of Apple’s business is going nowhere. Could Apple go the other way and slash iPhone prices? I ran the numbers. If Apple cut prices back to 2016 levels, it would have to sell 41 million additional phones just to match 2018’s revenue. 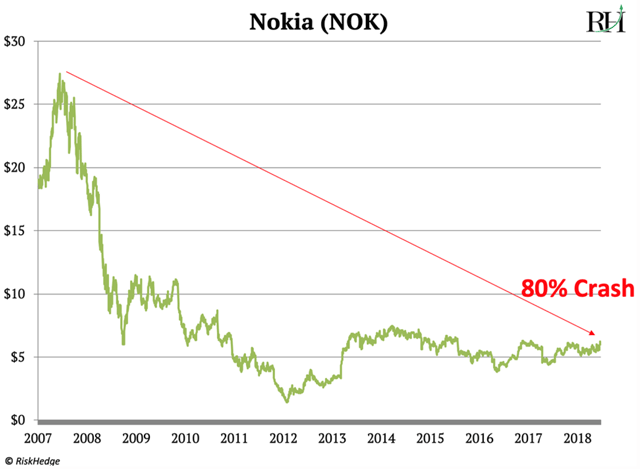 Before Apple, Nokia (NOK) was king of cell phones. Next Wednesday I’m taking part in the first-ever American Disruption Summit. It’s going to be a fun and profitable night for all attendees. Just for showing up, you’ll get the name and ticker of a small $5 “disruptor” stock that has 500%+ upside in the next two and a half years. We’re broadcasting from New York City, but you can watch online for free. Go here to reserve your seat. 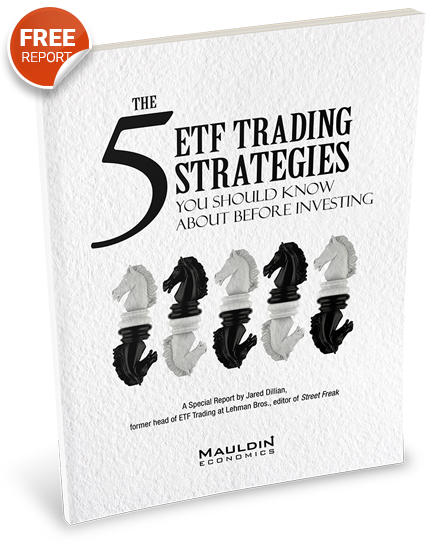 As a RiskHedge reader, you already know how important disruption is to your investing results. At the American Disruption Summit, we’re gathering together world-class disruption experts to tell us where they’re putting their money in 2019. Hope to see you there. You can reserve your seat right here. And if you can’t make the premiere, no worries—a replay will be available to all who register.